Timing, as they say, is everything. A perfect example of this old adage occurred two weeks ago. As I sat down to write the next installment in my series about the best of Epcot, there was an eruption of Epcot news coming out of D23 Expo 2017 in Anaheim. More specifically, I was about to start crafting the final piece of my Future World Trilogy—The Best of Future World East—when, lo and behold, big news came out pertaining to, you guessed it, Future World East. I found myself sidetracked from my exploration of the first half of Epcot and last time I was compelled to focus on what I thought were the best of all of the many D23 Expo Walt Disney World announcements. I think it's always a great time to be a Disney fan, but it looks like the next four years leading up to Walt Disney World's 50th anniversary are going to be enthusiastically magical. 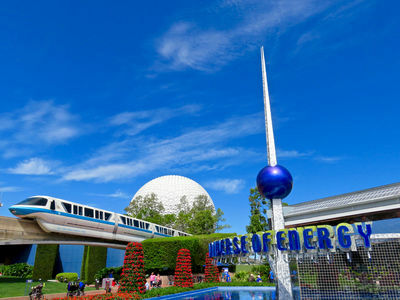 A lot of that magic is going to be happening in Epcot, and a significant portion of the magic announced so far is going to be happening in Future World East. This writer and Epcot aficionado couldn't be happier about that. I've long thought that this half of Future World has been in need of some attention and it looks like I wasn't alone in that thought. Whenever I enter Future World East I realize how little time I actually spend in this corner of the park. Despite having two of Disney's all-time best attractions, I'm just not in this section of the park all that much. The reason for that is simple and it's one of the reasons I'm so excited for two of the big announcements from D23: Quite frankly, there's just not that much back here. Let's make a comparison to its sister on the other side of the world, Future World West. As far as dining options, there are two excellent sit-down restaurants, Coral Reef in The Seas pavilion and The Garden Grill in The Land. The Land pavilion also has one of the Disney's best food courts, Sunshine Seasons. This will soon change with the announcement of the space themed restaurant, but currently there are no dining options in Future World East. I suppose, one can count The Electric Umbrella located in the Innoventions building, but I place that in Future World Central. The only thing to really eat in Future World East is ice cream. As far as the lay of the land goes, Future World West has its eastern counterpart beat. I'm a tremendous fan of the trees, landscaping, and ponds that surround the Seas, Land, and Imagination pavilions. As I said in my West article, it's one of my favorite places to walk around in Epcot. East does have some beautiful flower beds and lawns, but it lacks the same cohesive landscaped feel and tranquility that the western side has. I don't want to spend too much time bashing Future World East. After all, it has two of Disney's best attractions and pavilions. And it looks like greater things are on the horizon—classic Epcot reference fully intended. So let's plow on through to the final piece of my Future World excursion and take a look at the Top 5 things to see in Future World East. This is an unusual and unique thing that you can do a few times each year in Epcot. An essentially shuttered pavilion is re-opened for use as a festival center for Epcot's Food and Wine and Flower and Garden festivals. Even if you're not a foodie or you don't have a green thumb, if you're there during these festivals take a trip into the Festival Center and see what used to be. 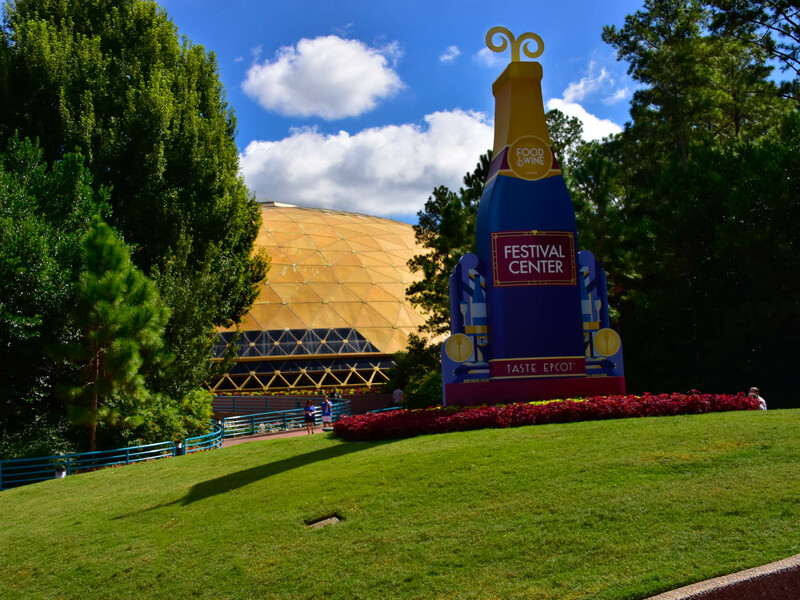 The Festival Center gets dressed up for the Epcot International Food and Wine Festival. Photo by Bonnie Fink. It's an impressive structure, and I hope that there's more to come for this pavilion. It was alluded to at the D23 Expo that the announcements made were only the beginning for what lies ahead for Epcot. This pavilion is a massive piece of real estate that can and should be turned into something more than an occasional festival center. Make a point of checking it out the next time you're rushing over to Mission: SPACE and Test Track. It's a piece of Disney history. Flower towers decorate the front of Universe of Energy for the Epcot International Flower & Garden Festival. Photo by Alan S. Dalinka. As we go to press on this article on August 4, the Universe of Energy pavilion literally has its days numbered. The building and the attraction within are scheduled to close on August 13, a mere nine days from now. I am thrilled to welcome the Guardians of the Galaxy to Future World East. I'm a huge fan and can't wait for a breath of fresh life into this corner of the park. Ellen did have its highlights though, including a unique ride system, a roof full of solar panels that purportedly helps power the attraction inside, the wonderful trip through the age of the dinosaurs, and the chest shaking Big Bang. It's a very cool looking structure. See it while you can. I'm including this as a separate entry all its own because I think it's an incredibly overlooked gem of Epcot. The Advanced Training Lab is the post show of Mission: SPACE. After your return to Earth and before you enter the ubiquitous gift shop, there's a plethora of space themed activities to spend some time on. Most people don't realize that the Lab can be accessed by walking in through the Mission: SPACE Cargo Bay gift shop. You don't have to go on the attraction at all if you don't want to. Take my family for example. I'm the only one of five that thoroughly enjoys Mission: SPACE. I spent several excursions to Mars by myself until we realized that everyone can wait for me in the Advanced Training Lab and have their own space type fun. 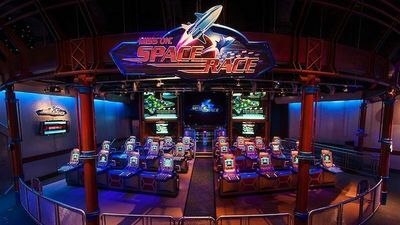 The little ones can climb through the Space Base playground while they wait for you to land and then you can all have a blast with Mission: SPACE Race and Expedition Mars. Don't forget to send some digital postcards to your friends back on Earth. It's a great looking room and an awesome air-conditioning break in the summer. I think the only thing more polarizing than Mission: SPACE at Disney is the "it's a small world" theme song. I am a proud fan of the song that you can never forget, and I'm a big fan of Mission: SPACE as well. In my personal opinion, people should try and forget the negative history of this incredible attraction and give it a shot. The addition of the non-spinning Green mission truly made this a ride for everyone. Mission: SPACE is one of the coolest looking structures in all of Walt Disney World. Photo by J. Jeff Kober. The queue is one of Disney's best and shouldn't be missed by anyone. If you can handle the spinning Orange mission—yes, it's as intense as you've heard—then you're in for an unforgettable ride. This is one the best things that Disney has ever done. There's nothing else like it. I like to experience both the Green and the Orange missions and I'm looking forward to a new mission film when the attraction reopens later this summer. I was a big fan of this attraction during its original iteration. I like the newer version even more. The whole addition of designing your car as you wait was a stroke of genius; it's an amazing use of downtime. The effects inside are excellent and the lightning-fast lap around the outdoor track speaks for itself. I've gone faster in my own car, but it's never been this much fun. Test Track in Epcot's Future World East is as popular now as it was when it first opened. Photo by Alan S. Dalinka. The post show experience is a ton of fun as well. Who doesn't like sitting in cars they can't afford like the Corvette? Test Track is one of Disney's ultimate attractions, completely unique to them and always a crowd pleaser. I don't know anyone that doesn't like this experience, and that's why it's a solid number one for Future World East. Usually, with my Top 5 lists, I'm lamenting the omissions. There are inevitably things I've left out. The big difference is, at least for the time being, this is pretty much everything in Future World East. With the additions of the upcoming space themed restaurant and a Guardians of the Galaxy takeover of the Universe of Energy, this side of Future World is going to be a much bigger pull for me. Mission: SPACE and Test Track are always a must do for me, but as I said above, I don't spend a lot of time in this section of Future World. I anticipate that will change in the future and I'm looking forward to it in a big way. I'll have a whole other section of Epcot that I can spend time in. I can't ask for much more than that. That finishes up Future World for this series. It's time to move onto the countries of World Showcase on our journey through Epcot. Before we embark on that adventure, click on the link below and let me know your thoughts on Future World East and I'll see you next time with another Disney Top 5. "The addition of the non-spinning Green mission truly made this a ride for everyone." But my problem with M:S isn't the spinning - it's the claustrophobia. And on this front the green side is no better than the orange side. Once that control panel comes slamming down I go into freak out mode. I rode once, and don't plan on going again. To be fair, I only rode Test Track one, back in 2008, but I didn't see the appeal of riding around in a car that started and stopped, and then went fast. I would much rather go on Radiator Springs Racers again. It has the speed factor, plus the Disney dark ride feel too. I won't suggest it rises to Top 5 status, but I enjoy seeing the Jammitors do their thing, especially when they are in either F&W or F&G mode as the Chefs or Gardeners. I am not always one who tries to see all the various entertainers, but after I saw this once, I now will try to take time to see a show if I am anywhere in the vicinity of Future World during one of their time slots. This is one Disney Top Five that I wouldn't be able to fill. There's just not much I really love about Future World East. The Universe of Energy is my favorite attraction here, but that's not saying much. We ride Test Track maybe once every other trip to Florida -- only if the line is short -- and we haven't been on Mission: Space in probably five or six years. Mission: Space was great when it first opened, but it just doesn't have the repeatability factor for us that most other rides do. Since we're there for the Flower & Garden Festival or the Food & Wine Festival almost every year, we do spend most of our Future World East time in the Wonders of Life Building. Unfortunately, we do that mainly because of the nostalgia it brings about, as the "Festival Center" holds very little appeal for us aside from being a cool place to sit for a while. This is the one area of WDW that has the most rides that fall into the "we sure miss that ride" category. The World of Motion, Cranium Command, Body Wars, and especially Horizons are all deeply missed. Heck, we even liked the old version of Test Track better than the newer version; at least the old version seemed to make sense, with its demonstration of the various kinds of testing new cars go through. I'm glad the Guardians of the Galaxy are coming to Future World East, though. Despite my love for Ellen & Bill Nye the Science Guy, it's time for a new attraction there. I'm also looking forward to new missions on Mission: Space, as they might make the ride interesting again (at least for a while). I do hope they find something permanent to go into the old Wonders of Life building. I always thought it would be a good spot to put the Carousel of Progress, which would be both in keeping with the theme of Future World and also allowing space to be freed up in Tomorrowland for something new. Another wonderful article, Chris, thanks for posting! 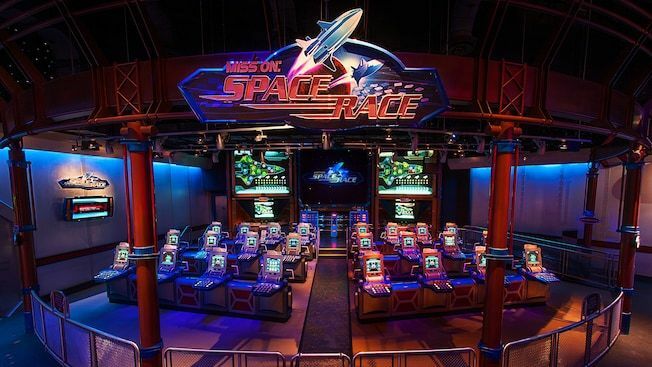 Totally with you, I think Mission: Space and Test Track are amazing! I am NOT able to handle Orange at all, but am so so glad I tried it once. It really feels like you're going to space. They've really captured something magical with that ride; I absolutely recommend it to everyone, if they're up for it! I have not tried Green nor really remember the lab from my last visit, but would love to check them out next time. 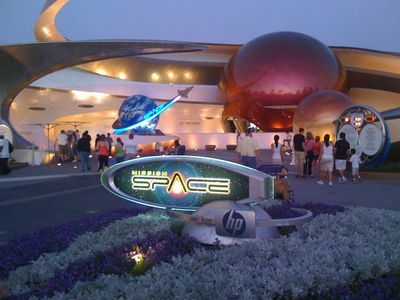 Everything related to Mission: Space is a space fan's dream come true! 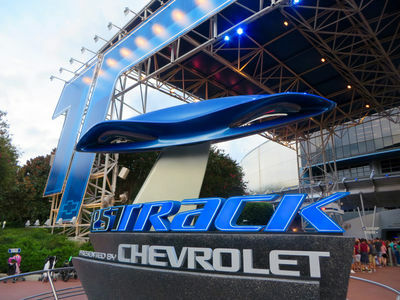 Test Track was loads of fun in its first form and the new one sounds even better. I personally was not a huge fan of the original queue; the grinding machinery noises were waaaay too loud for me in such crowded and enclosed place. The new queue sounds really cool and very engaging, I can't wait to see it! While I think Ellen is fun, the ride has been feeling its years for a bit and I'm very excited about a fresh replacement. I do miss Wonders of Life, but seeing the golden dome always makes me happy and I'm glad it lives on in some form. Thanks Dan. And yes, I could imagine that guests with claustrophobia would be well advised to steer clear of Mission:SPACE's confined space. For those who don't suffer, the closed-in feeling makes things that much more realistic. I imagine a space capsule to be pretty confining. Honestly, I'd rather go on Radiator Springs Racers as well, but I don't get that chance!! I do thoroughly enjoy Test Track. To me, it's more than just stop and go and then go fast. The Jammitors are on the "Can't Believe After All These Years I Still Haven't Seen It" list. I got queasy just reading this article. Locked down in orange was a huuuuuuuuuugggeee mistake. Claustrophobia with motion sickness. Ugh!!! At least I had the sense to jump off the Harry Potter ride when I saw the lock down shoulder restraints. I am looking forward to some new things in that part of Epcot. Good for Disney for constantly upgrading. Wow! I guess it just shows that for all of us, certain things that we see as common or something we seek out, there are others who have just never gotten around to that thing at all. I didn't see Jammitors probably for the first 2 years or so when I did a single visit each year. I forget when I first saw them right now. It's not by any means an absolute, but I will try to remember to spend some time over there around one of their shows to catch at least part of it. Later, after the transition to some new acts followed, I stopped briefly for the Lumberjack show that replaced Off Kilter. I enjoyed what I saw of the show, but didn't figure there was a huge rush to see the whole thing on my first visit since they just opened. By the next time I went to WDW, they were cancelled too. I'm not suggesting Jammitors is at immediate risk (but who knows with the FW long term renovations alluded to recently with the artist conception of the FW area), but we never know when something will be gone next trip. (as the GMR and Energy Adventure closures demonstrate next week).